When I think back to how I learned to love food and cook, I often am reminded of working at a restaurant called The Hatteras. It is no longer there, but when it was, it was before its time. The menu changed seasonally, the meats, seafood, and produce were sourced as locally as possible. The restaurant had its quirks for sure, but one thing was always true – the food was spectacular. In the winters when it was slow, the chef would let me work behind the line, and would teach me how to make some of the menu items. This shrimp boat is one of the first things that he taught me how to cook. He ended up teaching me how to make a 6 course meal. I was moving to South Carolina, and he wanted me to be able to fit in with the Southern debs. I am not sure if that ever happened, but I did learn a lot from cooking with him. This shrimp boat was an appetizer on our menu. While we never used a recipe in the restaurant, this is exactly how I remember it tasting. If I had to guess, I would say that this serves 4 to 6 as an appetizer. On this particular evening, I made it for dinner, so my portion was larger than normal. Since we are in the Lenten season, I am cooking a lot more seafood, and this is perfect for a Friday night. I have also made this the same way, but instead of bread, tossed it with pasta. My one piece of advice, make sure that you have everything ready to go before you start to cook anything. Once you start cooking, the whole thing is done in about 8 minutes. You do not want to be in the middle and realize that you still need to open the bottle of wine, and your garlic is burning. 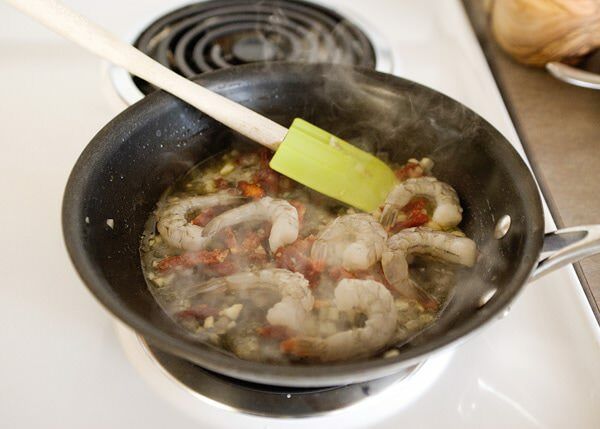 Preheat your oven while you are chopping your shallots and garlic, by the time you are ready to get cooking, the bread and shrimp will be ready at the same time. Slice the baguette into wedges. About 4 inches. 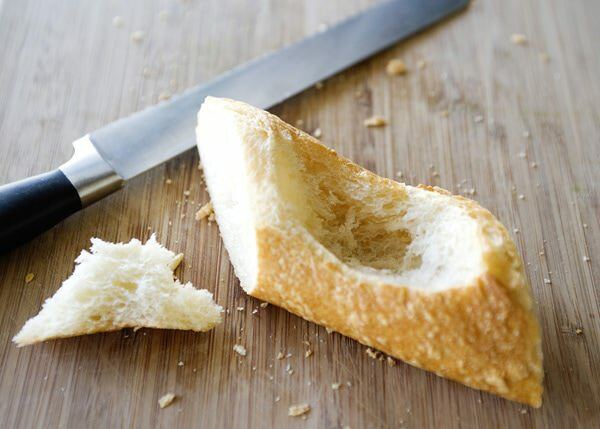 Using a knife, cut a hole about halfway into the baguette, making a boat of sorts. Put the bread into a 350 degree oven and get started on the shrimp. By the time the shrimp are done, your bread will be nice and toasty. 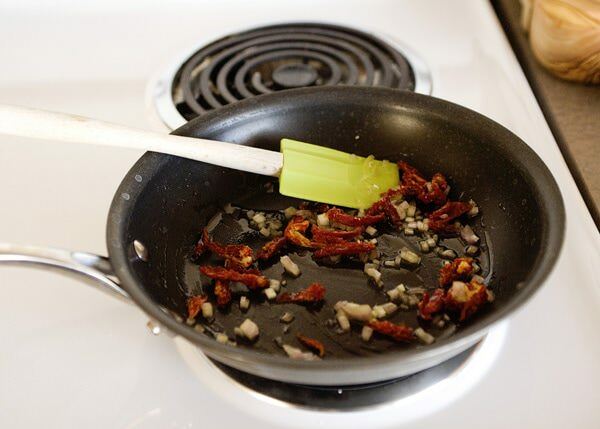 Have everything ready to go before you start to cook, it goes very quickly once you start. Like 8 minutes from start to finish. Heat a medium saute pan over medium high heat. 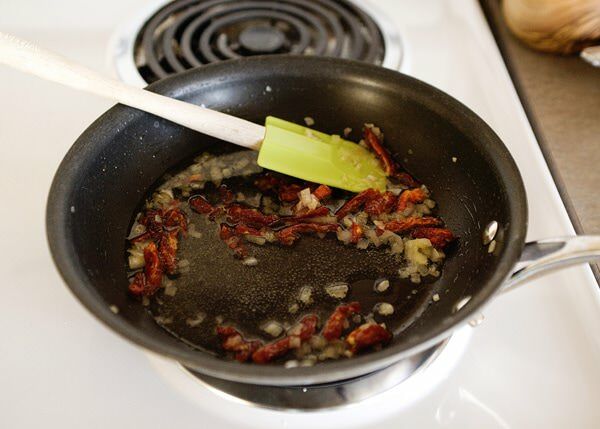 Add the olive oil, shallots, and sun dried tomatoes. 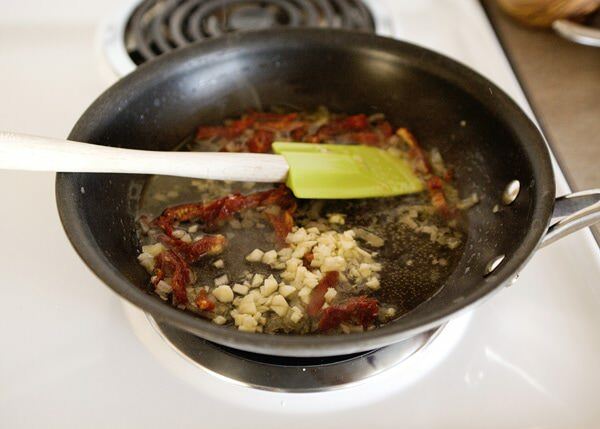 Cook for about 3 to 4 minutes or until the shallots begin to soften. And the garlic. Cook for about 30 seconds. 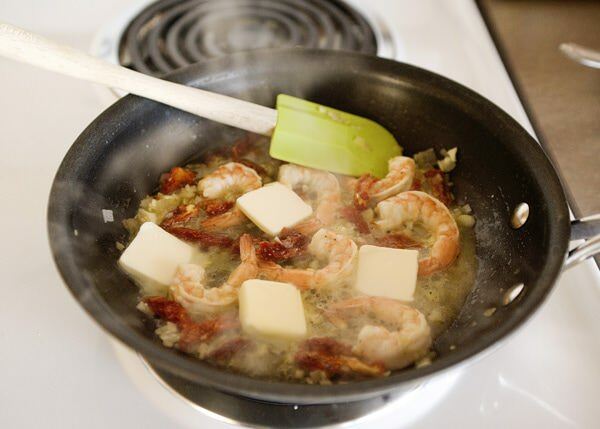 When the shrimp are almost cooked, add the butter in pats, stirring. It will thicken the sauce. 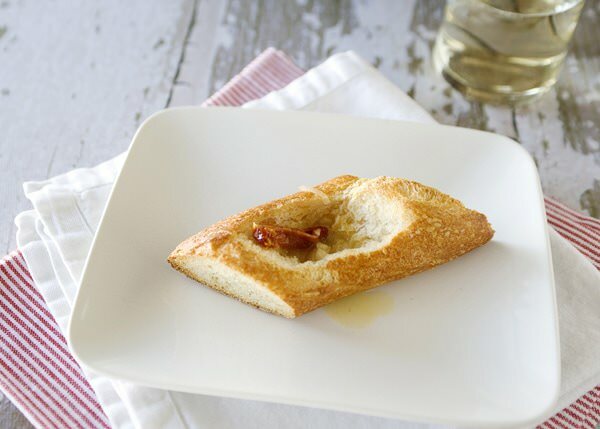 Take the bread out of the oven and put it on a plate. Pour some of the sauce directly into the bread. Top with the shrimp and more sauce. Garnish with chopped basil and Parmesan cheese. Add the wine. And the garlic. Cook for about 30 seconds. Add the shrimp. 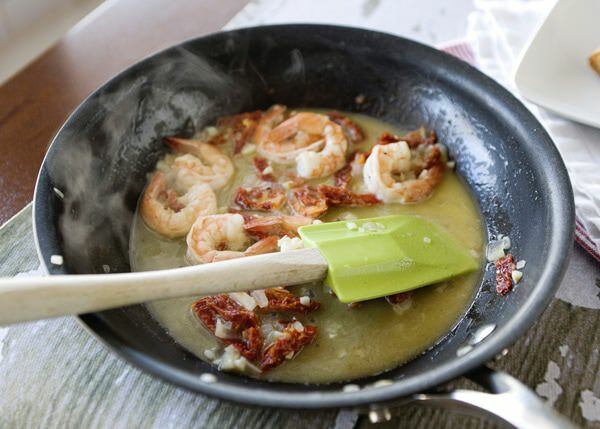 When the shrimp are almost cooked, add the butter in pats, stirring. It will thicken the sauce. Season with salt and pepper. I’m pregnant and I crave shrimp ALL THE TIME! This looks amazing! I could eat it for breakfast! That is a weird pregnancy craving! But shrimp for breakfast? Have at it! This sounds so good! My husband will love it! I hope that he does! My husband loves this for dinner. Me neither Erin! It is all about the bread over here. I just nominated you for Best Food Photography on SAVEUR’s Best Food Blog Contest. 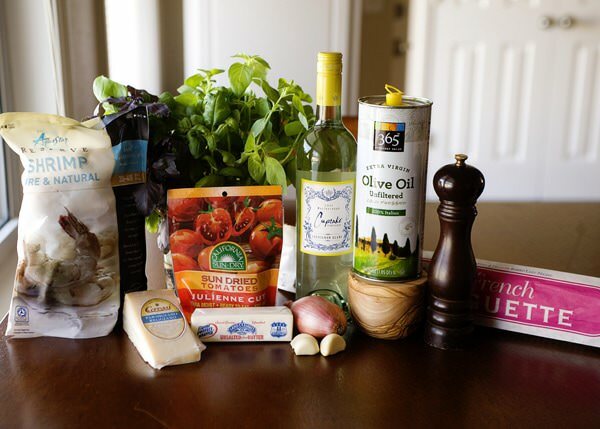 Your lovely recipes are so perfectly photographed. I even sent my photography student son to your site to see how a pro does it! Thank you for your obvious love of food, and for sharing it so beautifully. I am so flattered Mary! Thank you so much for the nomination, that means so much to me. I have really been focusing on my photography lately, and it is nice to know that people are noticing. Looks fantastic. I love a meal that takes 10 minutes to make including prep and digging shrimp out of the abyss that is my freezer. Me too! It takes longer to prep the shallots and garlic than to cook it! 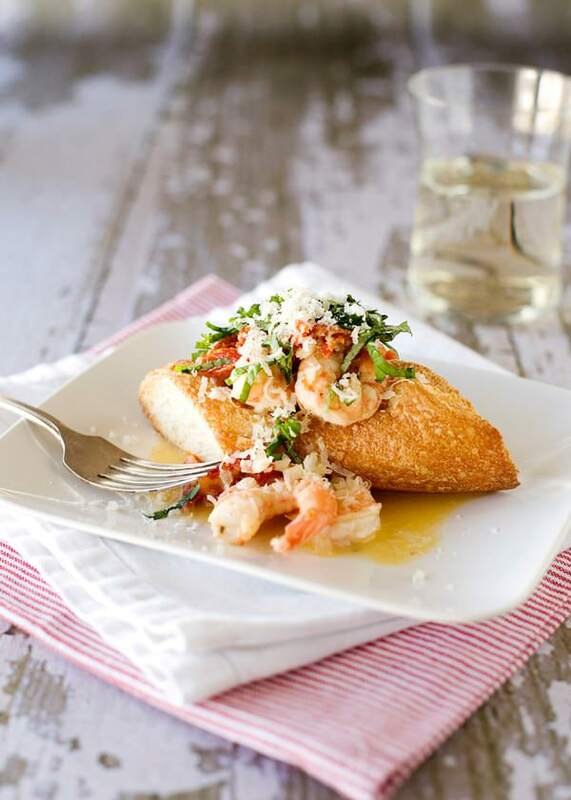 This looks like the best of shrimp scampi with the garlic butter already soaked into the bread so you don’t even have to sop it up! Can’t wait to try it! That is exactly what it is! It is heavenly. 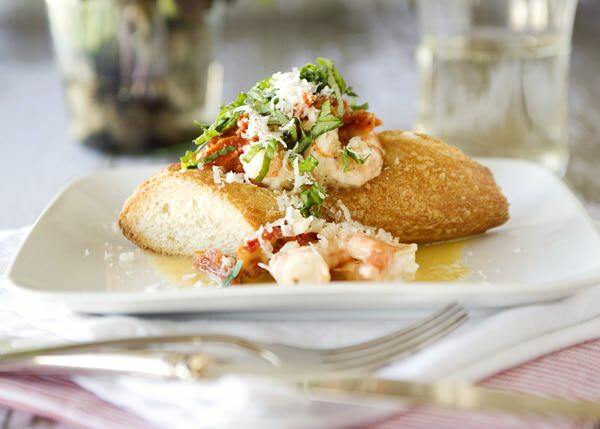 I love shrimp…this looks delicious and simple to make. Great photo! stunning! these boats look luxurious! How could I have totally forgotten about these? Sooooo good! Can you also recreate the Kahula pie with the Oreo crust – the one with the fresh whipped cream? I am really wasting away these days and need that back in my life. That’s all. 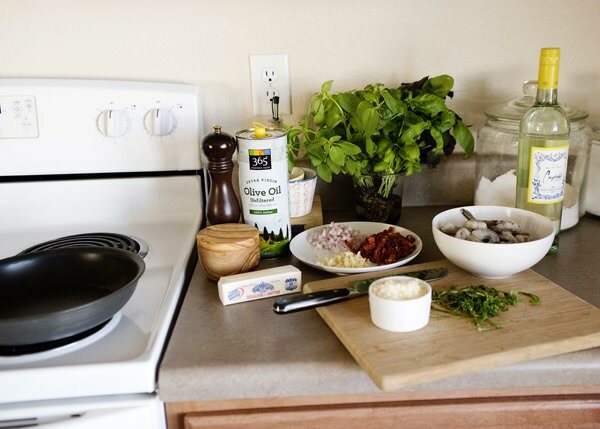 Shrimp is on my top 5 list of favorite seafoods…these boats are adorable and I love that the cooking process only takes 8 minutes give or take – this is important for me because not only are there not enough hours in the day but sometimes I want a delicious meal that doesn’t require hours on end. Great recipe, looks delicious! Then this is a great recipe for you. It takes longer to chop the shallot and garlic than to make the whole thing. Looks delicious! Thank you for the recipe and by the way, I love the silver! Yummy!! Shrimp is my favorite! Actually I don’t cook much. All I can do is just making pancake, sandwich, and baking bread with my Zojirushi BB-HAC10 bread machine. Don’t ask me to do it without a bread machine. I’m so glad that you share this Shrimp Boat recipe! It looks so delicious. I can’t wait to make it at home! I hope that you do make it Jessica, it is easy and incredibly delicious. This looks wonderful. Your food photography is outstanding. thank you so much Carole! That is nice of you to say. 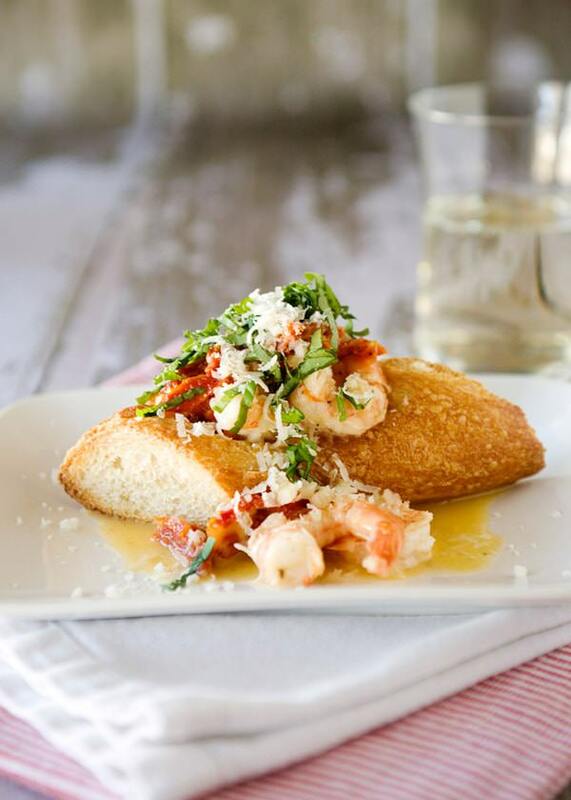 Ohhh bread… and shrimp.. this is so my thing. 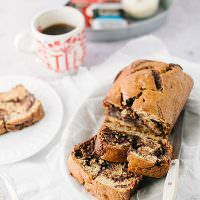 Love this recipe Bree! thank you Laurie! It is one of my favorites. Love the fact that this only takes 8 minutes to whip up once everything is set up! Cannot wait to make this, and more so, cannot wait to eat it. It takes no time at all. And it is too die for. This looks lovely. And fast! Your restaurant story reminds me of my own: I was a waitress in a restaurant where lunch shifts weren’t that busy. I tended to hover around the kitchens until the chefs showed me how to cook. I learned the fastest, easiest cream sauce from those guys. Yum! Did you ever post it? 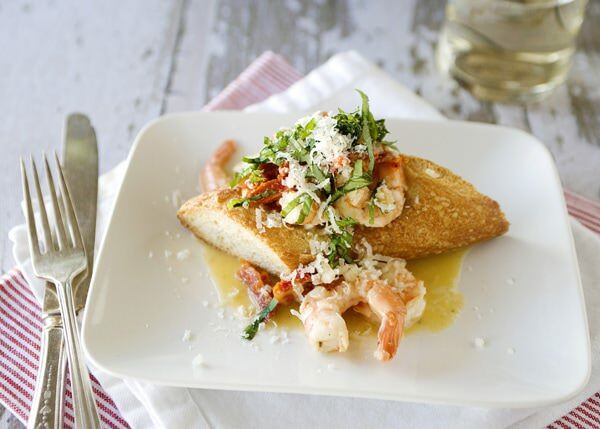 Love this idea; shrimp is one of my favorite dishes! Thank you for posting this…can’t wait to try it next week. 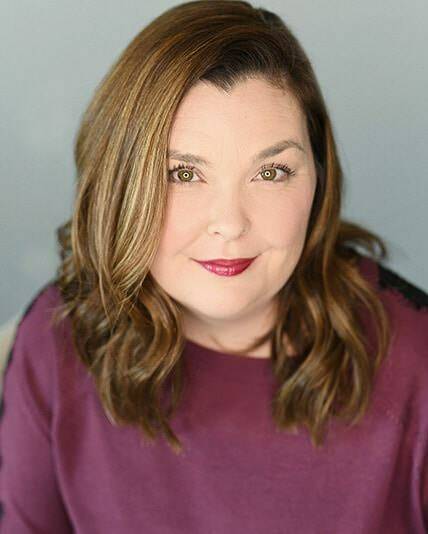 Just found out you’ll be at the Dole Conference, too and I’m so excited to meet you! I will be there! I look forward to meeting you.